How do you compare with the average U.S. “Consumer Unit”? The average “consumer unit” surveyed had 2.5 people and earned $62,857, which is slightly down from the previous year’s earnings. This “unit” unit spent $49,067, but the chart doesn’t include taxes or savings. The national savings rate is around 1%, so let’s assume the unit saved a pitiful $629 for the year, and was taxed $13,161 (or 21%). Spending for housing was $16,895, or about $1,400 a month. In a big city, you’d be lucky to get a small house for that cost, but as a nationwide average it’s amazingly high. Even though the housing bubble has burst, we’re still paying for it! Too bad transportation costs aren’t broken down by car/commute vs air/travel. I’m curious how much the average unit spends getting to work. Mostly so I can gloat, since in our family it’s near $0 (yay bikes!). We have 5 people, and earn more than average (though we live in a major city so cost-of-living is higher). We “spent” every penny of it, though almost 15% of it was spent on savings (the big goal this year has been building an emergency fund). Food spending was $8,100, of which $6,214 was spent on meals at home, or $130 per person per month, not counting the baby. I’m especially proud that we were able to stay near the US average, while still enjoying so much local, sustainable, healthy food (amazingly cooked by Venessa). Our entertainment spending was less than half the national average, though I feel like we experienced a lot of culture this year. We have memberships to the science center and zoo, and we’re symphony subscribers for the first time ever. 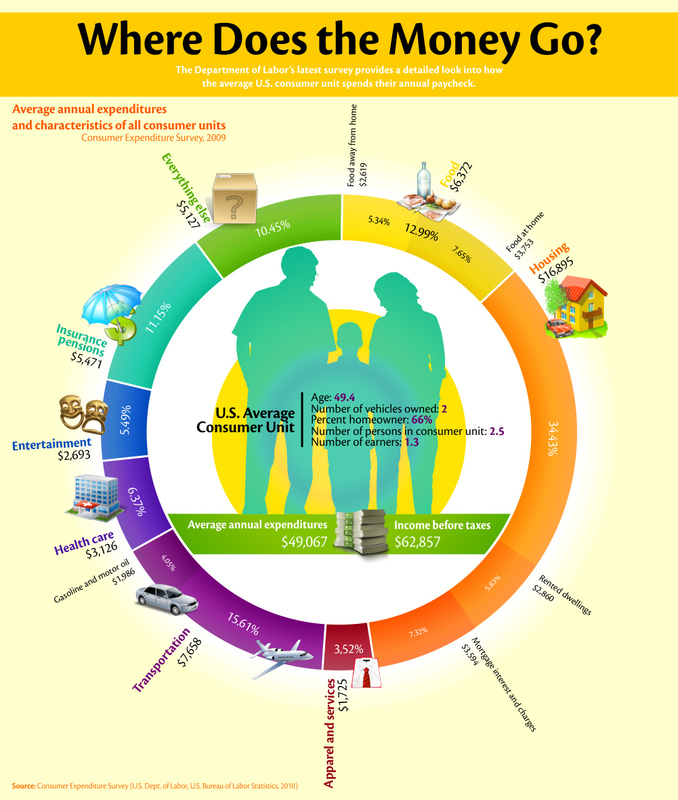 How does your consumer unit’s spending compare to the “average” American’s? Don’t be concerned with whether you’re spending more or less in any given category. Instead, be proud that you track your spending to begin with.